What Water Should I Drink? Having a basic (as opposed to acidic) pH, that is, a pH higher than 7. 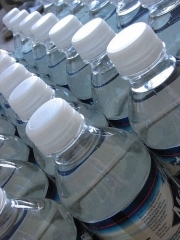 Water that contains ozone, which has many beneficial preservation and health properties. A molecule made up of an oxygen atom and a hydrogen atom connected by a single bond. A molecule capable of slowing the oxidation of other molecules. Oxidation is a chemical reaction that can damage cells. Any molecule with a single electron left unpaired, making it highly reactive. A measure of how acidic or basic a solution is. Summary: There are many types of water available today. Some are better for your health than others. Water is the most important substance of life. Quite simply, you can't live without it. Should you ever become lost in the woods, for instance, your survival priorities are in this order: water, shelter, and food. The human body is composed of 80% water, a ratio that must be maintained for good health. Water plays a role in virtually every bodily function, including digestion, circulation, nutrient absorption, body temperature, and the removal of toxins. The primary source of proper hydration is water, and plenty of it. There are many different types of water sold in stores today: mineralized, de-mineralized, distilled, ozonated, filtered, and spring water. Throughout the world, though, many people have chosen to drink ionized water all day every day for good health. For over 20 years they've been noticing that installing a water ionizer results in alkaline water that is cleaner, better tasting, and better for them. All water ionizers currently manufactured have titanium electrodes that have been dipped in platinum. These electrodes are not stainless steel, and it is important to note that they are coated with platinum, not electroplated. The ionizing process separates the acid from the alkaline minerals in water, with better quality water ionizers offering various levels of alkalinity. Ionized alkaline water is created by running pre-filtered tap water over the electrodes within the ionizer. About 70% alkaline and 30% acid water is produced. The alkaline water flows out of the stainless steel nozzle at the top, and the acidic water runs into the sink. Acidic water is also beneficial. It can be stored and used externally on skin irritations, for washing hair or for watering plants that thrive on acidity. Ionizers are very easy to hook up to most conventional faucets. Through daily use of ionized water, you can detoxify your body and cleanse it of acid waste build-up. An ionizer with several levels of increased alkalinity allows you to build up the amount of alkalinity over time. Since alkaline water has a detoxifying effect, start at lower levels so as not to stress your system as it eliminates toxins, and increase the amount over several months. Several benefits have been reported for ionized water. Water produced by an ionizer will contain a cloud of tiny bubbles. The hydroxyl ions in ionized water oxygen molecules offer high levels of oxygen, increasing the body's energy and alertness. alkaline water helps balance the body's pH level, which is often acidic due to an unhealthy diet, carbonated beverages, stress, and exposure to environmental toxins. Ionized water will not pull out valuable minerals like calcium, magnesium, and potassium (which carbonated water and water with added chlorine or fluoride may do). Ionized water is up to six times more hydrating than conventional water, because the water molecule cluster has been reduced in size and changed in shape to hexagonal, which allows the water cluster to pass through our tissue more easily. Ionized water acts as an antioxidant, effectively neutralizing free radical damage to the body. Unlike regular tap water, ionized water is a natural free radical scavenger, helping to protect cell tissue by converting the free radicals to oxygen. When used in cooking, ionized water helps bring out the natural taste of foods and juices. Using the alkaline water to reconstitute your juices from concentrates will result in a sweeter taste with less bitterness because the acids will be neutralized. Tea and coffee will taste better, and vegetables will retain a natural texture and colour, with brighter greens and yellows. Rich and rolled oats will be fluffier after being boiled in ionized water. Many people agree that ionized water is the healthiest water on the planet, the best water they've ever tasted, and up to six times more hydrating than tap water. Investigate the benefits of a water ionizer today. This article is adapted from Peter Young's article "What water to buy" (Vista, September/October, 2005. p. 42,75). Updated November 2009.